Thanks to A Mother’s Boutique for being a big sponsor of the Baby-Mama Shower Event! One of the things that every expecting mother does before the birth of her child is clean. Some call this “nesting” while others just call it “necessary.” Either way, cleaning is something that must be done in preparation of a birth and then forever more afterwards. One problem that pregnant women, mothers of small children, and just people in general come into though is of the synthetic chemicals involved in cleaning. No one should have to breathe in toxic fumes that many of these cleaners emit, nor should children or pregnant women be around them! We’ve gone to using only natural cleaners in my home at all times and while baking soda and vinegar still hold a place in my heart, the convenience of an already assembled spray bottle cleaner is what I use for most of the cleaning now. http://rcm.amazon.com/e/cm?t=life0fd-20&o=1&p=8&l=bpl&asins=B0033UJ5R8&fc1=000000&IS2=1&lt1=_blank&m=amazon&lc1=0000FF&bc1=000000&bg1=FFFFFF&f=ifrSeventh Generation just released a new line of EPA registered disinfecting cleaners and wipes that kill over 99.99% of germs including the Influenza A Virus. This is the first time I’ve seen a “natural” disinfectant, and I’m guessing that people everywhere will be excited over this. The key ingredient is thymol, a component of the herb thyme. This can be used on any hard surface and as I said earlier, kills the nasties! I was able to try their new multi-surface cleaner, bathroom cleaner, and disinfecting wipes. All of the products worked well and I really enjoyed the shape of the spray bottles and ease of use. I did not enjoy the scent of these products as I found them to be very medicinal and remind me of cough syrup. If you don’t mind the scent though, or if you value a clean surface over a momentary smell, this would be a product to try. I love knowing that a container of wipes will clean something as well as bleach but that I can breathe it in without worry and also that it isn’t going to irritate my hands! Choosing cleaning products without indoor air pollutants like volatile organic compounds, or VOCs, is a simple and effective way to reduce your indoor air pollution. If you’re not prepared to switch everything overnight, start by swapping out the one product you use the most, and moving forward from there. we’d like to know and travel to areas that we sometimes don’t intend them to. Don’t contaminate your food by prepping it on a surface that may contain harsh chemical residues – rinse cleaning products from food preparation surfaces carefully or use botanical disinfecting cleaners that do not require a rinse step. Think twice about the items that you’re using to clean and dry your kitchen equipment and dishes. Use rags (like old t-shirts and washcloths) instead of paper towels. If you aren’t prepared to kick your paper towel addiction just yet, use only recycled versions that are unbleached or haven’t been whitened with chemicals containing chlorine and see how long you can make a roll last. Wash your hands with soap and water before and after prepping food, and always before eating. So much of what can be potentially harmful in a kitchen can be reduced by this simple act that doesn’t require any harsh chemicals whatsoever. 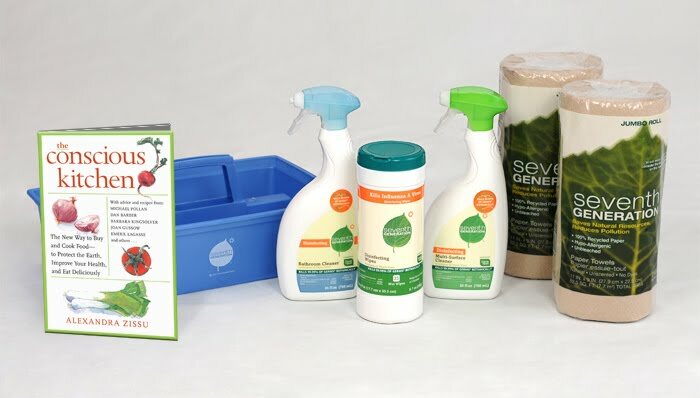 One winner will receive a Seventh Generation “Disinfecting Cleaning Kit” that includes a disinfecting multi-surface cleaner, bathroom cleaner, wipes , a copy of The Conscious Kitchen, a cleaning caddy made from recycled plastic, and two rolls of 100% recycled, unbleached paper towels. Value of around $35.00. http://rcm.amazon.com/e/cm?t=life0fd-20&o=1&p=8&l=bpl&asins=B0033UJ5QO&fc1=000000&IS2=1&lt1=_blank&m=amazon&lc1=0000FF&bc1=000000&bg1=FFFFFF&f=ifrTo enter, you must be a subscriber or follower of mine and tell me. That’s it! Please leave an email address and comment below for EACH entry. Contest ends May 7th, 2010 at noon, EST. Good luck! Products for review and giveaway have been provided by MyBlogSpark and Seventh Generation. No other compensation was received for this post and the opinions are all mine. I am following you on Google connect.